Choose from dyed or undyed fibres (which you can dye with Acid dyes yourself if you wish) to make your own fascinating silk paper. 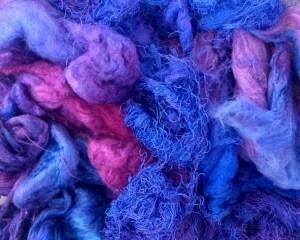 Combine different fibres for textural results. Some fibres contain natural sericin - for other you need to choose a textile medium/paste. Silk paper can be used in embroidery, collage, paper-arts and for 3D work.